A portal, or a book, can be read in many ways. Some people read from the beginning to the end; others use tables of contents and indexes to search out material; still others jump around at will. That is true of this portal too: One can follow the table of contents that, itself, follows the order of the Siddur. Or, one can use the search function to seek materials that sound interesting or appealing. Or, one can browse through these Mystical Meditations about Jewish prayer. Any method works. To facilitate movement among the Mystical Meditations presented and also between the various sections of the portal, I have embedded links to material that appears elsewhere. Only sustained study, however, can give one a sense of the interwoven character of the material. One must follow the links, reflect, and then go back to the various interlinked texts. For further reference, I have embedded links to the WorldCat. This site, which has cataloged over two billion books, gives the reader a full bibliographical reference, and if one sets the WorldCat page properly, it will also identify the closest library with a copy of the book. Finally, for those who read Hebrew, I have included a transliteration of the original texts. It is meant to be readable and does not pretend to be scientifically correct. Jewish spirituality is rooted in the ability of every person to sense the holy and to relate to the personhood of God. Everyone has these capacities, though some have more natural sensitivity than others; indeed, some are gifted in the ways of spirituality. The analogy to musicality is useful: Everyone has some sense of music, though there is a substantial range to this capacity as seen in the barely musical to the truly gifted. God comes to us “naturally,” so to speak; we only have to be listening and then enhance our capacity for contact with the divine. To develop one’s Jewish spiritual abilities, then, one must recognize such abilities and want to refine them. To do so, one needs to acclimate to the language, learn the intellectual background, and follow the practices of the tradition. First, the intellectual framework in which we reach out for God is a hierarchy, there being a distance between us and God that is bridged by a clearly defined set of beings (angels, spheres, hypostases, sefirot, and so forth). Second, attaining an awareness of God is a function of climbing up the hierarchy. The experience is achieved with a clearly defined technique for scaling the distance between us and God along the hierarchy. Third, after scaling the hierarchy, in most forms of Jewish mysticism, the various types of mystical experience of God’s presence remain quite abstract. They are Presence without attribute, Being without predicate, non-self, no-thing, negation of negation. Fourth, these experiences are totally beyond the control of the mystic. He or she can neither force them to come, nor adequately shape them or determine what will become of them. Most mystical experiences themselves are passive, though the way to them is very active. Thus, Jewish mysticism demands very rigorous intellectual knowledge of the specific hierarchy and very intense practical training in navigating the hierarchy. There are several types of Jewish mysticism, each with its own hierarchy and set of techniques for ascension. This section of the portal teaches the reader how to use the Siddur (prayerbook) within the framework of the Jewish mystical tradition that is rooted in the Zohar. These meditations take a great deal of concentration. It takes time to figure them out, to do them, and then to practice them so that you feel comfortable doing them. You cannot do this while in synagogue; the service moves too fast and there are too many people around. Study the meditations in this portal and do them at home. Only when you are comfortable with them should you bring them to synagogue. Even then, you will need to be able to do them faster than you would on your own. Kabbalistic meditation is not for everyone. As noted, it requires rigorous knowledge and intense training. If you don’t understand it, if it is too complex, if it seems preposterous, or if it takes too much time, let it go. If you are ready to try, don’t rush; take your time. No one is born with this knowledge; everyone learns it – the hard way. A portal, or a book, can be read in many ways. That is true of this portal, too: One can follow the Table of Contents that itself follows the order of the Siddur. Or, one can use the Table of Contents and/or the Index to search out materials that sound interesting or appealing. Or, one can just browse through these Insights into Jewish prayer. Any method works. To facilitate movement among the Mystical Meditations presented and also between the various sections of the portal, I have embedded links to material that appears elsewhere. Only sustained study, however, can give one a sense of the interwovenness of the material. One must follow the links, reflect, and then go back to the various texts. For further reference, I have embedded links to the WorldCat. This site, which has catalogued over two billion books, provides a full bibliographical reference and, if one sets the WorldCat page properly, it will also identify the closest library with a copy of the book. The word Kabbala refers to the many streams of Jewish mysticism; hence “kabbalistic” indicates that which pertains to Jewish mysticism in a broad sense. The Zohar is, perhaps, the central text of the Kabbala. The meditations in this section are rooted in the Zohar. They are prayers that use the sefirot (see below) and the liturgy at the same time. The reader will need to know something about zoharic kabbala to make sense of and use these meditations. I shall give a short summary here; however, you will want to know much more. The Zohar teaches that the very inner being of God is not abstract but is expressed in ten dimensions of being or, perhaps better, ten aspects of God’s personhood. Each of these is called a sefira; together, they are called the ten sefirot. They are most easily understood when we think of them as the structure of our own inner being, as indeed some later commentators taught. Each sefira has a central meaning: God’s grace, God’s compassion, God’s wisdom, etc. Each is also associated with a name of God: YHVH, Elohim, Shaddai, etc. Some are designated by Hebrew letters: Yod of YHVH, Hey of YHVH, Aleph, etc. Each is said to correspond to a part of the human body. Most are represented by a color. Many are associated with human relationships: Father and Mother, King and Queen, Lover and Beloved, etc. Some terms are coded: “Community of Israel” is routinely used as a symbol for Malkhut; “Tree of Life” stands for Tiferet; “Most Hidden One” is a symbol for Keter; “Sea” stands for Bina and ometimes Malkhut; and so on. A list of all the representations would fill several pages of print. The symbolism of the Zohar flows out of images used in biblical and rabbinic literature, and it is reinforced by the power of meditation. It is multilevel and simultaneous, that is, several levels of meaning apply at once, as in good puns. Mixing metaphors is considered a fine art. In any given passage, one must expect to find the same sefira referred to with several designations, and the entire realm of the sefirot and the dynamic flow of energy among them expressed in the simultaneous use of several metaphors. Thus, the river beds contain light; the orchard contains kings; the Queen is watered from the deep stream; and so on. Ultimately, zoharic thinking is rooted in association rather than logical thought. It is art, not science. One needs time, and practice, to “decipher,” and then to use the many symbols and levels of meaning. The first sefira is Keter; it is the ultimate inexpressibility of God. It is God’s ineffability. Keter is that part of any being that simply cannot be known, no matter how much we know; it is that which is beyond statement and analysis. Keter cannot be represented; it is outside, above, beyond. Keter is sometimes called Ein Sof, the infinite; not in a spatial sense but in the sense that Keter cannot be contained within any boundaries. The second sefira is Hokhma; it is God’s intelligence, knowledge, and wisdom. God’s intelligence is the first aspect of God after ineffability. It is articulation, expression. It is the starting point for God’s inner reality. Hokhma is masculine, Father; it is represented by the Hebrew letter yod, the first letter of God’s Name, YHVH, and it resides in the head. The third sefira is Bina; it is God’s understanding. Intelligence and understanding are not the same; the latter involves intuition and empathy. Bina is the source of repentance, of renewal, of re-turning; without it, being cannot go forward. Bina is womanly, Mother; it is represented by the Hebrew letter hey, the second letter of God’s Name, and resides in the heart. The fourth sefira is Hesed; it is God’s grace; it is the love that God has for us, which we do not deserve. We are the objects of God’s grace simply because we are God’s creatures; God’s love flows out to us, without our doing anything. Hesed is represented by the color white, by the figure of Abraham, and resides in the right arm. The fifth sefira is Gevura; it is God’s judgment, God’s power. Gevura is God’s ability to fix limits, to set standards and to demand that we live up to those standards. These perfect standards, if enforced, would subject us to terrible fear and punishment. Fear and judgment go forth from this sefira. Gevura is represented by the color red, by the figure of Isaac, and resides in the left arm. The sixth sefira is Tiferet; it is God’s compassion. It is the point where God’s grace and judgment flow together. Tiferet is mercy; it is the mixing of unconditional love and unconditional demand into a compassionate, merciful attitude. Tiferet is the inner voice of God, the inner Torah of reality. Tiferet is masculine, King, Son, and Lover. It is represented by the Hebrew letter vav, the third letter of God’s Name, by the color green/yellow, and by the figure of Jacob; it resides in the solar plexus. The seventh sefira is Netsah; it is God’s timelessness, God’s eternity. Timelessness is the perdurance, the continuity, of being. Netsah is represented by the figure of Moses, and resides in the right leg. The eighth sefira is Hod; it is God’s awesome beauty. God’s beauty is powerful, transcendent, sublime, and holy. Hod is represented by the figure of Aaron, and resides in the left leg. The ninth sefira is Yesod; it is fundamentality, passion, productivity. Yesod is God’s ability to act. Yesod is the fountain and point-of-flowing-forth of God’s energy. Yesod is masculine; it is represented by the figure of Joseph, and the tip of the letter vav; it resides in the male reproductive organ. The last sefira is Malkhut; it is God’s Face to the world, God’s interface with the world; it is God’s ruling power and providence. Malkhut is the point where God ends; after it, come creation, revelation, redemption, and judgment. Malkhut is also the point where humanity touches God; it is the gate of prayer and mysticism, of spirituality and ecstasy. Malkhut is also known as Shekhina; it is the Presence. Malkhut/Shekhina is womanly, Queen, Daughter, and Beloved. It is represented by changing colors, by the figures of David, Rachel, and Esther, and by the second Hebrew letter hey of God’s Name; it resides in the Face. These sefirot are “vessels,” conduits for the divine spiritual energy that flows forth from Keter to each of the sefirot and then into creation. As a whole, the sefirot are also traditionally visualized as a human person. In this mode, the sefirotic realm is known as Adam Kadmon (“Primal Man”). Keter is above the head. Hokhma is the head, Bina the heart, Hesed the right arm, Gevura the left arm, Tiferet the solar plexus, Netsah the right leg, Hod the left leg, Yesod the sexual organ, and Malkhut the face (or mouth). Whatever the visualization, the sefirot form an energy system, each sefira radiating its energy to the others and receiving energy from them: Grace flows to judgment, ruling power receives from productivity, etc. The whole is interactive, dynamic; it is a spiritual ecosystem, so to speak. For that reason, some diagrams of the sefirotic tree have many connecting lines. As a spiritual ecosystem, the sefirot are not external to God; rather, they are inside God: “intradeical.” They are a very subtle but powerful depiction of the inner being of God, a description of the various and often conflicting elements that comprise the consciousness of God. According to the Zohar, these ten dimensions and the interactive, dynamic flow of energy among them express God as much as a flow and interaction of forces comprise the human personality. Further, according to the Zohar, human beings have the ability to participate in, and indeed to influence, this flow of spiritual energy through proper meditation. This energy flows toward us and, through meditation, we return spiritual energy to God. When our actions and meditations are proper, energy is drawn from Hesed, and grace and compassion prevail and, when our actions or meditations are sinful, energy is drawn from Gevura and judgment prevails. According to the Zohar, the purpose of prayer, then, is to touch God’s spiritual energy through meditation and to draw it down into the world. In a deeper sense, however, when we interact with the energy of God, we not only affect ourselves and the universe, we also affect God. God, the Zohar teaches, is interrelated to and interactive with us. The purpose of zoharic prayer, in this deeper sense, is to help right the inequities in the realm of the sefirot, to help God regain God’s balance so to speak and, by doing that, to reestablish the beneficial flow of spiritual energy from God to the universe and to ourselves. This process of “correcting” the flow of energy within the sefirot, that is, within God and within the cosmos, is called tikkun. Zoharic prayer is ultimately a tikkun of God; it is not praise, sincere petition, or even mystical experience. To use this type of meditation with the liturgy requires holding much in one’s mind: the words, their meanings, the zoharic meanings, and an awareness of the ebb and flow of spiritual energy in God and in the world. Zoharic kavvana is very complicated, and deep. Some of the meditations presented in this section are drawn from the Zohar and simplified,while others are zoharic in method and intent. They are all very powerful. It is written: “The one lamb you shall offer in the morning, and the second lamb you shall offer at evening” (Nu. 28:4). Prayers have been ordained to correspond to the daily offerings. Through the impulse from below there is a stirring above and, through the impulse from above, there is a stirring higher up still, until the impulse reaches the place where the lamp is lit and it is lit. Thus, by the impulse of the smoke [of the sacrifice] from below, the lamp is kindled above and, when this is kindled, all the other lamps are kindled and all the worlds are blessed from it. Thus, the impulse of the sacrifice is the tikkun of the world and the blessing of all worlds. The initial “impulse from below” is the smoke of the sacrifice and, more important, it is the substitute for sacrifice, that is, human prayer. The energy of human prayer, the Zohar teaches, rises to Malkhut/Shekhina, that is, to the lowest of the sefirot, the gateway to the divine. In Malkhut/Shekhina, the energy of human prayer creates “a stirring above,” that is, a flow of energy inside Malkhut/Shekhina. To put it clearly: the energy of human prayer, done with zoharic kavvana, stimulates a flow of energy within the divine; human prayer arouses God. From Malkhut/Shekhina, there is “a stirring up higher still”; that is, there is a flow of energy from Malkhut/Shekhina to Tiferet. Thus, the human prayer (impulse of energy) has generated not only an energy in Malkhut/Shekhina, but also a flow of energy from Malkhut/Shekhina to Tiferet. At the level of Tiferet, the “lamp is lit.” This is probably a reference to Bina, which is located above Tiferet. After the energy has touched Bina, “all the other lamps are kindled”; that is, there is a reversal of the flow of energy from Bina down the sefirotic tree to all the other sefirot. And then, “all the worlds are blessed from it”; that is, the flow moves outward from Malkhut/Shekhina to everything that is external to God: to the cosmos and, eventually, back to humanity. This process is called tikkun: the sending of energy into God by human prayer, the re-generating of the flow of energy within God, and the re-flowing of divine energy from God to creation. When the smoke commences to rise, the holy forms in charge of the world derive satisfaction and are disposed on this account to stir the grades above them until the impulse of the King desires to associate with the Matron. Through this yearning of the lower world, the lower waters flow forth to meet the upper waters, for the upper waters do not flow save from the impulse of the desire from below. Thus, mutual desire is kindled and the lower waters flow to meet the upper waters, and worlds are blessed, and all lamps are kindled, and upper and lower [realms] are endowed with blessing. This is a restatement, in different imagery, of the basic description of the nature of zoharic prayer. The “holy forms” and the “grades” are the sefirot. They stir one another until the “King” which is Tiferet experiences passion for the “Matron” which is Malkhut/Shekhina. Thus, human prayer (“the yearning of the lower world”) causes the energy of Malkhut/Shekhina (“the lower waters”) to flow toward the energy of Tiferet (“the upper waters”), and vice versa. When these energies fuse (“mutual desire is kindled”), all the sefirot and the lower realms are infused with energy (“blessed”). This is classic zoharic doctrine that human prayer is not just praise, petition, confession, and all the other processes described elsewhere in this portal. Rather, prayer constitutes a sending back of energy to God, indeed a sending back of energy into God such that God’s energy levels are stabilized and even augmented. This, in turn, results in an increased flow of energy from God to us. Prayer, according to the Zohar, is thus tikkun, a rehabilitation of the energy levels in God and, then, in the universe. Having deciphered the passage and understood its teaching, we must now ask: What does it mean? What does it mean to say that “we can return energy to God”? And that “God can receive energy into Godself,” in a way that changes the distribution of energy inside God? And then that God “re-flows” it to us? The best way to begin answering these questions is to try to understand them in human relationships. Sometimes we have a friend, or parent, or spouse, or child who seems “stuck,” mired down in the present or past. How can we relate to that person? One method is to engage his or her outer self, the part of the other that faces the world. We engage the anger, or the joy, or the depression. From there, we try to go further to engage the inner self, the inner voices of the other. We can do this if we are careful, sensitive, and intelligent. If we succeed in touching the inner self, we should be able to help the other to change, to realign her or his inner and outer selves into a greater whole. Then, energy will flow again from that person in a different, and better, way. This is how we help a friend, or parent, or spouse, or child. So it is with God, the Zohar teaches. God is not an impersonal Force or Power located somewhere out of time and space. Rather, God is personal being. And so God, too, can get rigid, lonely, disoriented. When that happens, blessing does not flow easily to the world. The Zohar teaches that, in such a situation, we can help God to realign God’s own energies. This we do through zoharic prayer. We recite the liturgy with zoharic kavvana. This allows us to engage the outer Face of God, the part of God that deals with the world, God’s Malkhut/Shekhina; we engage God at the edge of God’s person. This, in turn, enables God, and us, to move further into God, into God’s inner self, into the part of God that does not govern but is the core of God. We enter, through Malkhut/Shekhina, into God’s Tiferet, God’s inner voice. If we succeed in doing this, we help God to realign God’s inner and outer selves into a greater whole. We unite God with Godself. When this happens, energy flows, again, more freely from inner self to outer self, from Tiferet to Malkhut/Shekhina and, then, from outer self to the world. All this seems strange, perhaps preposterous or even offensive to some, but it provides great depth of theological insight for others. To pray the kabbala, to pray zoharically, is to enter into interaction with God. It is to risk engaging God on the level of the most basic energy of our selves/Self, and to effect tikkun in God and, hence, in the world. Lekha Adonay ha-gedula, veha-gevura, veha-tiferet, veha-netsah, veha-hod ki khol ba-shamayim uva-’arets; lekha Adonay ha-mamlakha veha-mitnase’ lekhol la-rosh. To You, Adonay, belong grace, judgment, compassion, timelessness, and beauty; for everything is in heaven and the earth; to You, Adonay, belongs dominion, and that which rises to all, to the head. These verses from the Tanakh (1 Chronicles, 29:10-13) became one of the central texts of the Zohar because it mentions so many of the sefirot in one form or another. The meditations on these verses are, therefore, presented first. The quotation occurs in the liturgy at the end of the Pesukei de-Zimra’ and again when the Torah is taken out of the ark. To recite these verses with zoharic kavvana, use one or more of the following meditations. Do not rush these exercises, and do not race from one to another. Spiritual meditation requires time; we need to give ourselves space to respond to God. Visualize the sefirot as a tree. Recite each word and think of the sefira of that name. Begin at Hesed, which is also called Gedula. Say “Lekha Adonay ha-gedula”, think Hesed, and meditate on God’s grace. Say “veha-gevura,” think Gevura, and meditate of God’s power. Say “veha-tiferet,” think Tiferet, and meditate on God’s compassion. Say “veha-netsah,” think Netsah, and meditate on God’s timelessness. Say” veha-hod,” think Hod, and meditate on God’s awesome beauty. Say” ki khol ba-shamayim uva-’arets,” think Yesod, which is “kol,” and meditate on God’s productivity. Say “lekha Adonay ha-mamlakha,” think Malkhut, which is “mamlakha,” and meditate on God’s dominion and sovereignty over the universe. Say “veha-mitnase’,” think Keter and meditate on God’s ineffability. Say “lekhol la-rosh,” think of Hokhma and meditate on God’s knowledge; then think of Bina and meditate on God’s understanding. Return to Hesed, and complete the sefirotic tree. In each case, prolong the word that is the name of the sefira until you feel the presence, or sense the energy, of that sefira. Remember that these are dimensions of being, that each sefira is part of the structure and being of God. Remember, too, that each sefira is different. Sense the reality of each of the qualities of the sefirot, separately: grace, power, compassion, timelessness, awe, productivity, dominion, and then ineffability, intelligence, and understanding. Dwell in each; then, sense the flow of spiritual energy from one sefira to the next. Do the meditation again. Think of the sefirot as oil lamps or candles that you can light. Light Hesed when you say “ha-gedula”; light Gevura when you say “ha-gevura”; and so on through “rosh” and back to Hesed. See and sense the light from each, and from the whole. Do the meditation again. Think of the sefirot in three dimensions, as a cocoon that surrounds you. Recite the verses and return energy to the sefirotic points of that cocoon. Feel the energy around you. Sustain it. Do the meditation again. Think of the sefirot as a human body standing opposite you. Recite the verses and return energy to the body-points of this being. Remember that this is divine, spiritual energy. Feel the flow toward you. Receive it. Do the meditation again. Think of your own body. Recite the verses and energize the body-points in which the sefirot reside. Do the meditation again. Move into the divine body as you do so. Feel the divine energy in Keter as an enveloping aura; let it energize you/the sefirot. This meditation reaches very far. Do the meditation again. This time, effect a tikkun; that is, return energy to the sefirot. Then, sense the completeness of the energy as it flows through the whole sefirotic system. Hold the whole in your consciousness for a few moments. Remember that the purpose of meditation on the sefirot is not to energize you, but to effect tikkun, that is, to restore and repair the flow of spiritual energy inside God. Blessing, which is the pouring forth of spiritual energy toward us, flows from this tikkun. In zoharic meditation, blessing is an epiphenomenon, a side effect. If you are in synagogue, it is customary to give charity after reciting these verses at the end of Pesukei de-Zimra’. Do so. Blessed be He Who spoke and the world came into being. Blessed be He Who does the work of creation. Blessed be He Who says and acts. Blessed be He Who decrees and fulfills. Blessed be He Who has mercy on the universe. Blessed be He Who has mercy on the creatures. Blessed be He Who gives a good reward to those who fear Him. Blessed be He Who lives forever and exists to eternity. Blessed be He Who redeems and saves. Barukh meshallem sakhar tov lirei’av. Barukh hai la-`ad ve-kayyam la-netsah. This prayer introduces the Pesukei de-Zimra’, which constitutes the section of psalms of praise that precedes the morning liturgy proper. The prayer has several versions; I follow the one customary in the ashkenazi Siddur. The zoharic key this version is the ten times that Barukh (“blessed”) is said, one for each sefira, bearing in mind that the first line is introductory. As you say, “Barukh she-’amar ve-haya ha-`olam” (“Blessed be He Who spoke and the world came into being”), prepare yourself for this meditation by thinking that it is through God’s speech, and yours, that the sefirotic world comes into being and is sustained. When you say, “Barukh hu” (“Blessed is He”), think of Keter which is beyond all description. Return energy to Keter; light it as an oil lamp or candle, and just be present for it for a few moments. When you recite, “Barukh `oseh vereishit” (“Blessed be He Who does the work of creation”), think of Hokhma, which is the origin point of all reality, the Father of all. Feel intelligence and creativity, and rest there a while. Then, connect the energy of Keter to that of Hokhma. When you say “Barukh ‘omer ve-`oseh” (“Blessed be He Who says and acts”), think of Bina which is the Mother of all, the upper temple, the source of repentance. Feel plenitude, and remain there. Then, connect the energy of Hokhma to that of Bina. When you recite “Barukh gozer u-mekayyem” (“Blessed be He Who decrees and fulfills”), think of Hesed, God’s unconditional love. Feel unconditional love, and abide there. Then, connect the energy of Bina to that of Hesed. When you say, “Barukh merahem `al ha-’arets” (“Blessed be He Who has mercy on the universe”), think of Gevura, God’s power and judgment. Feel the power, and dwell there. Then, connect the energy of Hesed to that of Gevura. When you recite, “Barukh merahem `al ha-beriyyot” (“Blessed be He Who has mercy on the creatures”), think of Tiferet, God’s compassion and mercy. Feel compassion, especially as it applies to living creatures, and reside there a moment. Then, connect the energy of Gevura to that of Tiferet. When you say, “Barukh meshallem sakhar tov lirei’av” (“Blessed be He Who gives a good reward to those who fear Him”), think of Netsah, God’s timelessness. Feel timelessness, and abide there. Then, connect the energy of Tiferet to that of Netsah. When you recite, “Barukh hai la-`ad ve-kayyam la-netsah” (“Blessed be He Who lives forever and exists to eternity”), think of Hod, God’s transcendent beauty. Feel awe, and dwell there. Then, connect the energy of Netsah to that of Hod. When you recite, “Barukh podeh u-matsil” (“Blessed be He Who redeems and saves”), think of Yesod, the active male force in nature and history. Feel productivity, and reside there a while. Then, connect the energy of Hod to that of Yesod. When you recite, “Barukh shemo” (“Blessed be His Name”), think of Malkhut which is God’s Name, God’s Face, God’s Presence to the world. Be in the Presence, face to Face. Then, connect the energy of Yesod to that of Malkhut. Hold the accumulated energy in your mind, and be present for it. When you continue the liturgy, draw the energy with you. Let the energy flow, through you, into the realms of creation: the outermost reaches of space, our portion of space, our planet, our lives, our community, and our selves. Feel one spiritual energy, drawn down from the Divine. Barukh she-’amar ve-haya ha-`olam (“Blessed be He Who spoke and the world came into being”). Prepare yourself for this meditation by thinking that the sefirotic world comes into being and is sustained through God’s speech, and yours. Barukh hu (“Blessed is He”). Think of Keter. God’s “hu-ness” is God’s being-ness, God’s being before articulation, God’s that-ness (quoddity), which precedes God’s what-ness (quiddity). Be in the presence of God’s being as “hu.” Return energy to Keter. Light it as an oil lamp or candle, and just be there for a few moments. Barukh `oseh vereishit (“Blessed be He Who does the work of creation”). Think of Hokhma. God’s creative action begins in thought, in wisdom. Be in the presence of the thought that creates. Light it as an oil lamp or candle, and just be there for a few moments. Then, draw energy from Keter into Hokhma, and let God’s being and God’s intelligent creative power be present together. Barukh ‘omer ve-`oseh (“Blessed be He Who says and acts”). Think of Bina. God’s empathic understanding is integrally linked to God’s ability to communicate, to say and to act. Be in the presence of the intuition that speaks and acts. Light it as an oil lamp or candle, and just be there for a few moments. Then, draw energy from Keter-Hokhma into Bina, and let God’s being, God’s intelligence, and God’s communicated empathy be present together. Barukh gozer u-mekayyem (“Blessed be He Who decrees and fulfills”). Think of Hesed. Hesed is God’s unconditional love for the universe; it is God’s grace; even in God’s decrees. Be in the presence of God’s grace as it ordains the laws of creation. Light it as an oil lamp or candle, and just be there for a few moments. Then, draw energy from Keter-Hokhma-Bina into Hesed, and let the being, intelligence, empathy, and unconditional love be present together. Barukh merahem `al ha-’arets (“Blessed be He Who has mercy on the universe”). Think of Gevura. Gevura is God’s ability to ordain the laws of nature and society, as a result of the being, wisdom, empathy, and grace that it receives. Be in the presence of God’s power and judgment. Light it as an oil lamp or candle, and just be there for a few moments. Then, draw energy from Keter-Hokhma-Bina-Hesed into Gevura, and let God’s being, intelligence, empathy, unconditional love, and power and judgment be present together. Barukh merahem `al ha-beriyyot (“Blessed be He Who has mercy on the creatures”). Think of Tiferet. God’s compassion and mercy is a fusion of God’s unconditional love (Hesed) and God’s power and judgment (Gevura). God’s creatures need God’s compassion and mercy to survive. Be in the presence of God’s compassion and mercy. Light it as an oil lamp or candle, and just be there for a few moments. Then, draw energy from Keter-Hokhma-Bina-Hesed-Gevura into Tiferet, and let God’s being, intelligence, empathy, unconditional love, power, and mercy be present together. Barukh meshallem sakhar tov lirei’av (“Blessed be He Who gives a good reward to those who fear Him”). Think of Netsah. God’s timelessness is not just God’s eternity; it is God’s perdurance, and it is God’s persistence (in a philosophic sense). God’s persistence is also linked to the moral dimension of God and creation. Be in the presence of God’s timelessness. Light it as an oil lamp or candle and just be there. Then, draw energy from Keter-Hokhma-Bina-Hesed-Gevura-Tiferet to Netsah, and let God’s being, intelligence, empathy, unconditional love, power, mercy, and timelessness be present together. Barukh hai la-`ad ve-kayyam la-netsah (“Blessed be He Who lives forever and exists to eternity”). Think of Hod. God’s transcendence, God’s awesome beauty, is always experienced by us as momentary; however, God’s transcendence is actually timeless. Be in the presence of God’s transcendence. Light it as an oil lamp or candle and just be there. Then, draw energy from Keter-Hokhma-Bina-Hesed-Gevura-Tiferet-Netsah to Hod, and let God’s being, intelligence, empathy, unconditional love, power, mercy, timelessness, and awesome beauty be present together. Barukh podeh u-matsil (“Blessed be He Who redeems and saves”). Think of Yesod. Productivity is one of the most powerful dimensions of human and divine behavior. Divine productivity redeems us from impotence, and it saves us from disorientation and distortion. Be in the presence of God’s productivity. Light it as an oil lamp or candle and just be there. Then, draw energy from Keter-Hokhma-Bina-Hesed-Gevura-Tiferet-Netsah-Hod to Yesod, and let God’s being, intelligence, empathy, unconditional love, power, mercy, timelessness, awesome beauty, and productivity be present together. Barukh shemo (“Blessed be His Name”). Think of Malkhut (Shekhina. All of God’s energy is focused on governing the world. This dimension of God is God’s interface with the world. It is God’s Name, God’s Face, God’s Presence. Be in the presence of God’s Presence, face to Face. Light it as an oil lamp or candle and just be there. Then, draw energy from Keter-Hokhma-Bina-Hesed-Gevura-Tiferet-Netsah-Hod-Yesod to Malkhkut, and let God’s being, intelligence, empathy, unconditional love, power, mercy, timelessness, awesome beauty, productivity, and Presence be present together. Hold all these dimensions of God in your consciousness: God’s being, God’s intelligent creative power, God’s communicated empathy, God’s unconditional love, God’s power and judgment, God’s great compassion and mercy for God’s creatures, God’s timelessness and persistence, God’s unending awesomeness, God’s redemptive and saving productive energy, and God’s ruling power and Presence. Stay in the presence of this fullness of God. And, when you continue the liturgy, draw this energy with you. This meditation is cumulative, and it takes time. Take the time to do it. Kadosh, kadosh, kadosh, Adonay tseva’ot; melo’ khol ha-aretz kevodo. The Zohar provides different ways to recite this verse from Isaiah (6:3) that occurs several times in the Siddur. The verse occurs part of the morning liturgy just before the Sh’ma, again in the repetition of the Amida, and again toward the end of the morning service. To recite these verses with zoharic kavvana, use the following meditations but be sure to leave yourself open to other meditative understandings of this verse; they will come to you, so you will not have to seek them. Do not rush the meditations, and do not race from one to another. Spiritual work requires time; we need to give ourselves space to be with God (Zohar, 3:93a; 2:52a). When you recite the first “kadosh,” think of Hesed, of God’s overflowing, unconditional love. Dwell there; then draw that energy out from Hesed. When you recite the second “kadosh,” think of Gevura, of God’s ultimate power and judgment. Abide there; then draw that energy out from Gevura. When you recite the third “kadosh,” think of Tiferet. Mix the overflowing love of Hesed with the power of Gevura and draw them to the compassion and mercy of Tiferet. These three form a group, an eternal triangle. Reside there. Do the meditation again: When you recite the first “kadosh,” think of Hokhma, of God’s intelligence and knowledge. Dwell there; then draw that energy out from Hokhma. When you recite the second “kadosh,” think of Tiferet, of God’s inner self, God’s mercy and compassion. Abide there; then draw that energy out from Tiferet. When you recite the third “kadosh,” think of Malkhut, of God’s engaged power, of God’s Face and Presence. Abide there; then draw that energy out from Malkhut. Mix the intelligence of Hokhma with the compassion of Tiferet and draw them to the engaged Presence of Malkhut. These three form a group, an eternal triangle. Reside there. When you recite the third “kadosh,” think of Yesod, of God’s productivity. Abide there; then draw that energy out from Yesod. Mix the intelligence of Hokhma with the compassion of Tiferet and draw them to the productivity of Yesod. These three form a group, an eternal triangle. Reside there. The entire verse can also serve as a meditation as follows: (Tikkunei Zohar, Haqdama 16b). When you recite the first “kadosh,” think of Hesed, of God’s overflowing love. Dwell there; then draw that energy out from Hesed. When you recite the word “Adonay,” think again of Tiferet. Adonay is one of the designations of Tiferet, especially in Tiferet’s relationship to that which is below it, for this is God’s compassion for the entire universe. Draw that energy out from Tiferet. When you say “tseva’ot,” think of Netsah and Hod, for they are “the hosts, the twins.” Dwell in the timelessness and in the awe of God. When you say “melo’,” draw the energy out of Netsah and Hod. When you say “khol,” connect the spiritual energy to Yesod. Kol is one of the designations of Yesod. Yesod is God’s productivity. Abide in the abundant productivity of God. When you say “ha-’arets,” remember that the fullness and wholeness of God is the sefirotic realm. Ha-’arets is one of the designations of the sefirotic realm as a whole. Draw the energy out from Yesod. When you say, “kevodo,” think of Malkhut. Kavod (“Glory”) is one of the designations of Malkhut. Malkhut is God’s active Presence in the world. Receive the energy of all the sefirot into Malkhut. Let all that energy be one and united. Reside in the fullness of God’s energy and Presence. (Blessed is the Glory of the Lord from its place). When you say “barukh,” sense the spiritual Presence of God, of God’s blessing. Think that Malkhut is about to receive holy energy from above. When you say “kevod-Adonay,” think of Malkhut. Malkhut is the “Glory” of Adonay, which is Tiferet. When you say” mi-mekomo,” think of Tiferet, which is the “place” of Malkhut, the source of its energy. Tiferet is the center of God; it is the inner voice of God. Malkhut is the Face; it is the outer voice of God. These two are in constant interaction with one another, as indeed there is a constant dialogue between our own inner and outer selves, between our inner compassion and our need to interact with the real world. Draw the energy of Tiferet to Malkhut; unite them. Yimlokh Adonay le-`olam, Elohayikh Zion, le-dor va-dor; Halleluya. When you say “kadosh kadosh, kadosh, Adonay tseva’ot; melo’ khol ha-aretz kevodo,” think of Hesed, Gevura, Tiferet, Netsah, Hod, and Yesod, as above. When you say “barukh kevod-Adonay mi-mekomo,” think of Keter, Hokhma, and Bina. When you say “Yimlokh Adonay le-`olam, Elohayikh Zion, le-dor va-dor; Halleluya,” think only of Malkhut. Draw the energy with you. Unify the divine energy; unify the sefirot. When you say “kadosh,” “kadosh,” “kadosh,” think of Hesed, Gevura, Tiferet. When you say “barukh, kevod-Adonay, mimkomo,” think of Netsah, Hod, and Yesod. Do not hurry these meditations. Take your time. There is no rush. Sh’ma Yisrael, YHVH [Adonay] Eloheinu YHVH [Adonay] ‘ehad. Barukh shem kevod malkhuto le-`olam va`ed. (Hear, Oh Israel, the Lord our God, the Lord is one. Do this four-fold meditation again when you recite the word Adonay for the second time. Say “‘ehad” (“one”) and draw Hokhma, Bina, and Tiferet — intelligence, understanding, compassion — into one energy. They fold into one another: first there must be knowability, then attentiveness, and then mercy. Then, bring this united energy to Malkhut, God’s Face. Merge intelligence, understanding, and compassion with Presence. Let Hokhma, Bina, Tiferet, and Malkhut — male, female, male, female / intelligence, understanding, compassion, and Presence — be one spiritual energy. Prolong the “ah” of “‘ehad” while you do this. When you recite the first “Adonay,” think of Hokhma. When you recite “Eloheinu,” think of Bina. When you recite the second “Adonay,” think of Tiferet. When you say “‘ehad,” unify Hokhma, Bina, and Tiferet. Then, think of Malkhut and bring it into the presence of the other three sefirot. Prolong the “ah” of “‘ehad” while you do this. Do the meditation again. When you recite the first “Adonay,” think of Hesed. When you recite “Eloheinu,” think of Gevura. When you recite the second “Adonay,” think of Tiferet. When you say “‘ehad,” unify Hesed, Gevura, and Tiferet. Then, think of Malkhut and bring it into the presence of the other three sefirot. Prolong the “ah” of “‘ehad” while you do this. When you recite the words “Sh’ma yisrael,” invoke the female presence of Shekhina, which is God’s guiding presence in the world, and hold it in your consciousness. When you recite the words “Adonay Eloheinu Adonay,” invoke the male presence of Tiferet, which is God’s inner being, God’s focused self. Think also of the other five sefirot — Hesed, Gevura, Netsah, Hod, and Yesod — separately. When you recite the word “‘ehad” (“one”), bring the energies of Hesed, Gevura, Netsah, Hod, and Yesod together into Tiferet. Unify the six sefirot above Malkhut. Let the focused inner self, be infused with the grace, power, eternity, awesomeness, and productivity. Prolong the “ah” of “‘ehad” while you do this. Then, whisper “Barukh shem kevod malkhuto le-`olam va`ed” (“Blessed is the name of the glory of God’s kingdom, ‘malkhuto,’ for ever and ever”). Bring Malkhut to Tiferet. Let them be one, male and female, united. Let inner self become one with the outer self. Let heart become one with face. Let God become one with Godself. Do the meditation again. There are six words in the Sh’ma, one for each of the sefirot above Malkhut. When you recite “sh’ma,” think of Hesed; when you recite “Yisrael,” think of Gevura; when you say the first “Adonay,” think of Tiferet; when you say “Eloheinu,” think of Netsah; when you recite the second “Adonay,” think of Hod; and when you say “‘ehad,” think of Yesod. There are also six words in the phrase recited in whisper after the Sh’ma. When you say them, bring all six sefirot into Malkhut in one union of male and female. Unite the upper realm of six with the lower realm of Shekhina. Keep your eyes covered and your head bowed during these meditations. After these meditations, wait in the silence of the union of the sefirot. Then, continue with “ve-’ahavta” (“you shall love the Lord, your God, with all your heart, with all your being, and with all your might”), reciting the whole paragraph while holding the moment of unity in your consciousness. There are other ways to meditate kabbalistically on the three paragraphs of the Sh’ma. Do not rush yourself. The first blessing ends with magen Avraham (“the shield of Abraham”). It is a prayer that deals with God’s presence in Jewish history; Abraham is the ancestor associated with this blessing. In the Zohar, Abraham is Hesed, so the first blessing is devoted to Hesed. Bring Hesed into your consciousness as you recite this paragraph with its blessing. The second blessing ends with mehayyei ha-metim (“Who resurrects the dead”). It is a prayer dealing with God’s presence in nature, especially in the resurrection; Isaac is the ancestor associated with this prayer. In the Zohar, Isaac is Gevura. Bring Gevura into your consciousness as you recite this paragraph with its blessing. The third blessing ends with ha-’El ha-kadosh (“the holy God”). It has two forms, the short form for personal recitation and the longer one for responsive communal recitation. It is a prayer dealing with God’s holiness; Jacob is the ancestor associated with this prayer. In the Zohar, Jacob is Tiferet. Bring Tiferet into your consciousness as you recite this paragraph with its blessing. On weekdays, there are sixteen intermediate blessings. They are all petitions. In the Zohar, one does not usually meditate on the sefirot during petitionary prayer. Recite the petitions with the appropriate non-zoharic kavvanot. Resume the zoharic meditations with the concluding three blessings (below). On Shabbat and Yom Tov, the intermediate blessing contains special paragraphs appropriate for Shabbat and Yom Tov and ends with mekaddesh ha-Shabbat (“Who sanctifies the Shabbat”) or mekaddesh Yisrael veha-zemannim (“Who sanctifies Israel and the holidays”). In the Zohar, Shabbat is often associated with Yesod, the fountain of all blessing. Hence, the intermediate blessing moves the meditation to Yesod. As you recite the paragraphs on Shabbat or Yom Tov, bring Yesod into your consciousness. The first of the final three blessings ends with ha-mahazir Shekhinato le-Zion (“Who returns His Shekhina to Zion”). It is a prayer for God to return to Zion and to the temple that stood there. God’s presence is called Shekhina. In the Zohar, this prayer alludes to the sefira of Nesah, God’s timelessness, that is, to the persistence of God’s being throughout all time. Bring Nesah into your consciousness as you recite this paragraph with its blessing. The second of the final three blessings ends with ha-tov shimkha u-lekha na’e le-hodot (“Whose Name is good and to Whom it is proper to give thanks”). It is a prayer of thankfulness for God’s many favors, for life and for guidance. In the Zohar, this prayer is associated with Hod, the awesome beauty of God. Bring Hod into your consciousness as you recite this paragraph with its blessing. The last blessing of every Amida ends with ha-mevarekh et `amo Yisrael ba-shalom (“Who blesses His people Israel with peace”). It is a prayer for peace — peace in the sense of coexistence but, more importantly, peace in the sense of inner harmony. In the Zohar, shalom is the blessing of Malkhut, of Shekhina. Bring Malkhut into your consciousness as you recite this paragraph with its blessing. Remember that all peace comes from Shekhina. During the concluding verses to the Amida and in the few minutes of silence after them, call each sefira into your consciousness. Make them one entity; unify them in their full power and Presence. Ya-éir Adonái panáv eilékha vîkhunéka. Yisá Adonái panáv eilékha veyaséim lekhá shalóm. (May the Lord bless you and keep you. May the Lord cause the light of His / the Face to shine upon you, and be gracious unto you. The “left” is Hesed and the “right” is Gevura. The function of the priests is, first, to arouse Hesed, that is, to feed energy back into Hesed. Then, the priests focus the energy, which is now found in Hesed, and draw it to Gevura; that is, they take the energy they returned to Hesed, plus Hesed’s own aroused energy, and bring it to Gevura, thereby arousing Gevura to higher energy. Then, the priests take the combined energy of Hesed and Gevura and bring it to Tiferet where, again, the incoming energy arouses Tiferet (“male”). 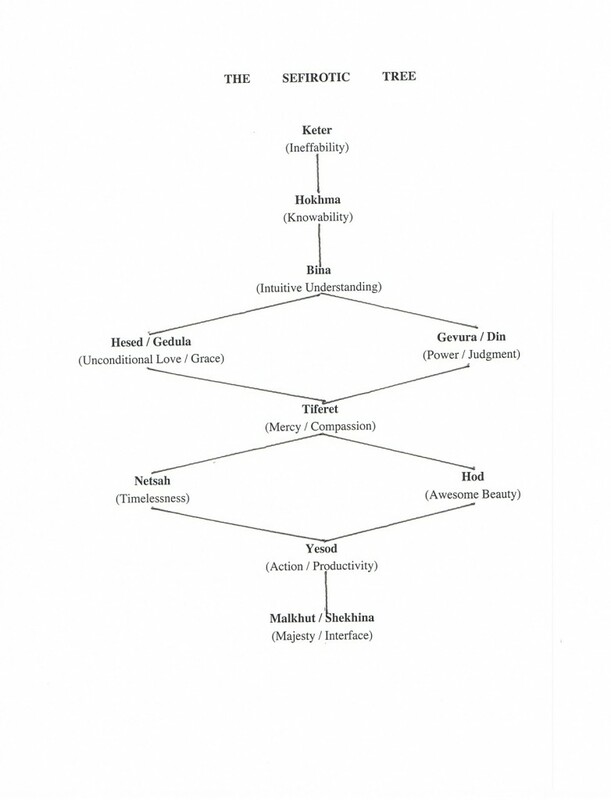 Finally, the combined energy from Hesed, Gevura, and Tiferet streams forth to unite with Malkhut / Shekhina (“female”). This completes the meditation process, and energy flows forth to all the sefirot and, then, to creation. According to the Zohar, “blessing” is the tikkun of the energy inside the realm of the sefirot (the Divine) and, then, its flowing forth to creation (that which is below the realm of the Divine). The whole is wonderfully embodied in the quotation from Song of Songs. 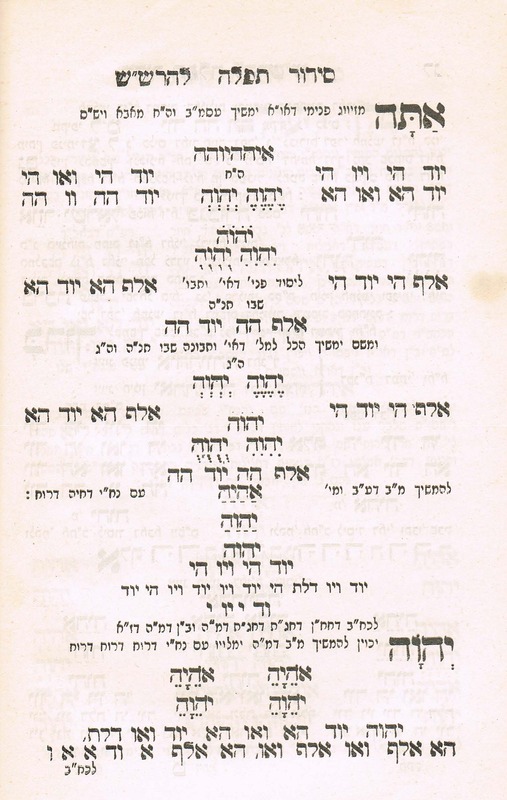 To recite this prayer properly, the priests must concentrate on Hesed while reciting the first line of the priestly blessing; on Gevura while reciting the second line; and on Tiferet while reciting the third line. They must also draw the energy from one sefira to another, adding to the energy as the recitation continues. The tune that is often chanted before the last word of each line serves to allow time for the priests (and the congregation) to meditate on the sefira of that line, that is, to return energy to that sefira and to draw it to the next. Return to the blessing of children and grandchildren and try to do it with zoharic kavvana. The world of the Zohar, sometimes called the Kabbala, is not the only world of Jewish mysticism. Each age has produced its own mystical way. Hasidism, which is much later than the Zohar, evolved a new form mystical experience called bittul (“annihilation into God”). In this form of mysticism, each person is composed of a “garment” and a “divine spark.” The purpose of prayer, in this hasidic mystical mode, is to shed all the “clothing” of existence and to let one’s spark abide for a moment in the great Nothing (Hebrew, `Ayin ) that is God. The following meditation based on this hasidic—non-zoharic, yet mystical—tradition points toward this. The story is a very profound one. Who am “I”? What is the “self”? It is strange; we use the word “I” all the time, but what do we mean by it? One might also look at the “I” in terms of the roles one fills in life. I am a father; that takes energy and inner strength. I am a husband; that, too, takes time and effort. I am a teacher; it demands vigor and intensity. I am a scholar; it demands concentration and stamina. I am a member of several communities, serving in various official and unofficial capacities. I am an active Jew, giving time and energy to my people. I am a friend, searching and supporting. I am a rabbi, a faculty member, a citizen, a consumer, an author and editor, a colleague, a student, a son, and much more. Some of these roles are more important to me than others. Am “I” these important roles? Am “I” the sum of all these social roles? The contemporary literary critic Northrop Frye has commented that the older we get, the harder it becomes to shed our social masks. That’s true, but are we our social masks? Let us entertain for a minute the possibility that “I” am not my social roles, that I am not everything that I must be to be a functioning, effective human being. What, then, am “I”? Perhaps, “I” am my personal history. Perhaps, “I” am my life and everything that has gone into it. It is true: I am my fears, my loves, my aspirations, my body, my mind, my guilt, my spiritual and aesthetic sensitivities. I am the complex person that I was born, was brought up to be, and have made myself into. In modern culture, we call this the “self” or the “person.” But is it true? Am “I” the sum of my feelings, concepts, and actions? Is my “self” defined by the range of emotions and thoughts of which I am capable? Freud has shown that we all have inner masks by which we talk to ourselves, even lie to ourselves; and that we have masks within the inner masks, unconscious motives and feelings of which we are unaware. This is true. But am “I” my conscious feelings and thoughts? Am “I” my unconscious feelings and thoughts? What, or who, am “I”? Let us entertain for a minute the possibility that “I” am neither the sum of my social roles nor the sum of my conscious and unconscious feelings and thoughts, that “I” am neither my social masks nor my personal masks. What, then, am “I”? To say that “I” am my “soul” does not help. For, if I mean that my “soul” is “divine” and, hence, I am a “part of God,” what exactly does that mean, aside from being a theologically acceptable answer? Am “I” a theological proposition? Am “I” an intellectual second thought? Let us start again. If “I” am not the sum of my social roles or my personal history, and if “I” am not a theologically acceptable hypothesis, what am “I”? Who am “I”? Who is the “I” that is capable of returning thanks to God? Or doing anything? Perhaps, “I” am truly no-thing, utter void, undefined. Not something ethereal, like a fine spray of water or isolated atoms in interstellar space; but no-role, no-feeling, no-thought. Not even the absence of these definitions; just no-thing. At first, this is very frightening. Nature abhors a vacuum and the mind abhors lack of definition. The “I” shies away from lack of location. That’s why we have culture. But, if culture is secondary, what is primary? If formulation and articulation are secondary, what is pre-articulate or pre-formulated? Jewish hasidic spirituality teaches that there are three levels of being: thought, speech, and action. First, we think; then, we put what we think into words; and then we act upon what we think and speak. But what precedes thinking? What is pre-articulate, pre-conceptual? Whatever enters our consciousness, even if it is chaotic, has some form; we give it more form by thought, speech, and deed. But what is before consciousness? What am “I” at this level of before-thinking, before-words, before-action? Ponder this question. List your definitions of your “self.” Then, realize that they are only categories of functionality in the world. Return to contemplating “Who am I.” Deal with each new “definition” in the same way—by categorizing and then discarding it. Eventually, you will arrive at no-thing-ness. Try to hold that moment in your consciousness. Then, return to reality and try to express what you experienced. Ponder this again, and again, and yet again. After the fear comes joy. But even the joy is secondary; it is a response. It is an echo. Joy is the realization that everything I think, speak, and do is secondary and tertiary: that my psychological functions and my social roles are clothes, decoration. Joy is the realization that “I” am no-thing, but God is; that even my no-thing-ness is only a mask for His being-ness; that “I” am, because He is; that, from the innermost point, “I-He” radiates through what my “I” thinks, speaks, and does. Joy is the realization that the “I” is not mine or “me”, but He; that “I” am nothing but He; perhaps, not even “He” in the sense of the God described in the words of the tradition, but “He” as the because of my “I”. Joy is allowing oneself to be aware of this. Joy is being open to this.